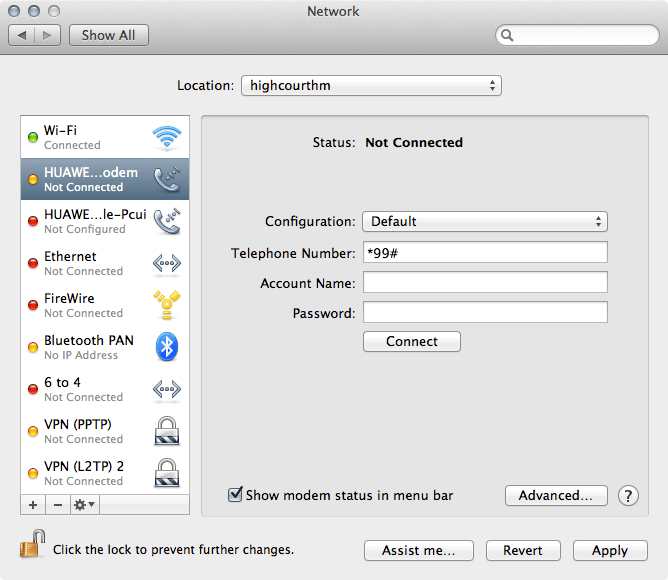 In my many searches for a Mac OS X Lion compatible driver, I managed to find the following from mobile provider “3” in UK. The link, http://ask3.three.co.uk/mbbdocs/drivers/apple_drivers.html, contains a link to “dongle drivers” for “Huawei dongles” that work for Mac OS X Lion (10.7). Sounds like a winner! So if you’ve just upgraded to Lion (now Mountain Lion too) and are trying to work out how to get your Huawei modem working properly with it, these instructions worked for me and I’m using it to write this post. Man, thank you so much! I’m using OS X Mavericks 10.9.2 and didn’t need to download the package; Huawei connection was avaiable in configuration. I did the settings with *99# and connected. Pretty simple and it’s working! Thanks a ton Sam. Your detailed step wise solution, has saved all the trouble for me. I was running pillar to post for the past 2 days and both Apple and Reliance said NO. Reliance is the most unreliable organization, as they intend only to sell their products, after putting their customers in trouble. They said clearly that you have to buy a new product. I said then why Reliance, I will buy anything except Reliance then. Now that you have helped me overcome this problem, I will continue with the product as long it works. But I swear NEVER to buy a Reliance again. None of the above works for me. I have had these problems since upgrading to Mountain Lion on my old Macbook Pro. I have downloaded drivers from all suggested sites and tried to install them. The installed ones do not work. The pkg from Huawei’s site is broken and cannot be opened. I have just about given up now. I don’t want to change my dongle as the performance is great. My solution is to get a mobile router. I use a TP-Link one. I can power it from the USB and simply plug the dongle into it. It works fine wherever I am in the world. My only slight gripe is that I cannot send / receive sms as I would be able to using Mobile Partner but at least it works and my internet is really fast here in Singapore. So, if it isn’t working for you, check out the TP Link routers. Thank you for the file but it doesn’t work for me. I installed it on my macbook pro but it is not displayed in the préférences menu. How to get it displayed in preferences? E1552 on 7/13/2014 this solution still works for Mavericks 10.9.3. Thanks. E1552 on 7/13/2014 this solution still works for Mavericks 10.9.3. Orange Spain prepaid. Thanks. Hey Sam! Thank you so much, you made my day ! I need help from you. I have Apple iBook G4. I wanted to install fresh copy of Windows 7 but even it failed to Boot from Cd rom. I also tried to us it as it’s but even i failed to install browser like “mozila, opera”. If i download it, there is no any way to install it. I request help for me to install Windows iam used to know instead of Mac OS X even my friends can’t us my iBook. I am waiting to read from you soon please. I wanna call you St. Moffat if I may 🙂 You saved my day too! Thank you very much sir. It worked for me.. I can now use photon plus on mac. Thank you, thank you once again. you have sorted my problem with the above solution. I used this method about 2 years ago on 10.7 and found it again today for 10.10. Excellent blog and cuts out the bloatware. u made my connection after 8 hour-no-hope searching!!!!!! your avice works almost 5 years!!!! so its eversome!!! The local service provider MAXIS Malaysia Technical team could not even help me at all. I guess it is their gimmick to get me to change to another package. Thanks so much for helping me. This save me a lot of money and saved me from getting conned into another package. Worked like a charm on mountain lion am in Kenya. Thanks! Hi does this work on Mac 10.10 Yosemite? I tried but it doesn’t seem too..can anyone help? …many thanks. Finally that was the only posts that helped me!!! and I just installed new macOS 10.12 and I’m looking for this driver, my Huawei e367 doesn’t wrok. Given 10.12 is pre-release it’s possible there are backwards incompatible changes in it that are preventing the older drivers from working and you might need to wait for a newer driver to be released. Anyone knows if 10.12 compatible drivers are available anywhere ? I’m sorry I can’t really help you out as I’ve moved on from using my old Huawei stick. Sorry!